My sculpture Experientia Nostra Ossiferous will be exhibited for the first time at the Freeport Art Museum in the If You Only Knew show. Have you ever looked at a piece of art and wished you could talk to the artist to better understand what you were seeing? What stories lie behind art and what exactly does it all mean? If that's the case, If You Only Knew may be the exhibition for you. Beginning on September 8th, viewers have the rare opportunity to discover truths behind one of a kind works of art from the artists themselves. From what originated as a 5 week group exhibition showcased at the Old Court House Arts Center located in Woodstock, IL, FAM is proud to present this intriguing exhibition. If You Only Knew breaks down the barriers between artist and viewer through letters personally written by each artist. Steeped in mystery and surprise, these letters hold the key to unlocking revelations about each artist and the work they have created. Whether funny, heartfelt, shocking, or private, it is up to the visitors to discover what lies behind the art displayed before them. Who knows what mysteries await? The exhibition opening will be on 5-8 pm September 8, 2018 and the show will run to November 3, 2018. I will be there at the opening and look forward to discussing my sculpture. Special thank you to Joe and Kathleen Isacson for curating the show. 2014-2018. 9”h x 16.5”w x 16.5”d. Human mandible, Bronze, Mahogany, Resin, Blown glass, Gold leaf, Silk, Acrylic, Hardware. 2014-2018. 19”h x 16.5”w x 16.5”d. 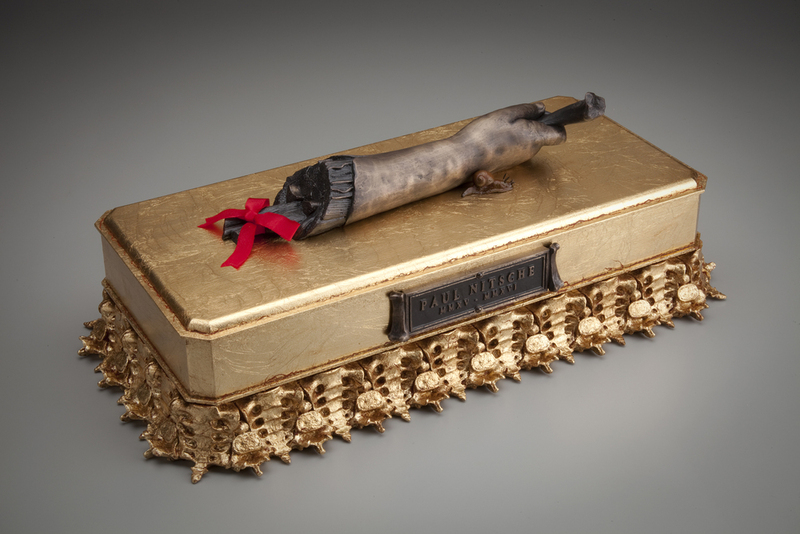 Experientia Nostra Ossiferous is a sculpture that blends the forms of the reliquary with the anatomical display. In a parallel sense, it draws its visual inspiration from myth, the Roman god Janus, and a rare congenital defect, diprosopus. Janus is the god of time, beginnings and endings. The Janus Head is characterized by two faces, one looking to the future, one to the past. Diprosopus, also known as cranialfacial duplication, is an extremely rare disorder whereby facial features are replicated to a certain degree. Bone holds its history and can be read like rings on a tree. As it grows and lengthens, as it breaks and mends, all can be told in diagnostic imaging. The title of the sculpture could be translated to "Our Ossiferous Existence", an existence we all move through, and like the Janus Head, hold one face to the future and one to the past. Bell jar made by Richard Jones at Studio Paran. 2018. 21" x 13" x 3"
My piece with Wisconsin painter Karen Halt will be shown as part of the Collaboration show at Abel Contemporary Gallery, July 27th to September 9th, 2018. The opening reception will be July 27th. A catalogue of all the collaborative works, along with commentary from the artist pairs, will be available for purchase. "Abel Contemporary Gallery invited artists in our collection to collaborate with one another on an art work that blends their unique styles and themes. Though the process of creating art is often thought of as a solitary process, compelling artists to work together transforms this trope as pairs communicate and cooperate. Encouraged to leave their comfort zone, sometimes working with materials they are unaccustomed with, the artists create work with a new emphasis and unique results." Detail of sculptural elements by Paul Nitsche. The cover of the Collaboration show catalogue from Abel Contemporary. I will be exhibiting five sculptures at Abel Contemporary Gallery, in Belleville, WI, as part of their Exquisite show, running from July 28-September 10, 2017. The sculptures are all pieces I have not exhibited at the gallery before. The show will also be the debut of my paper doll piece, The Anatomy Lesson. The works I will be exhibiting are: The Anatomy Lesson, Ossis Fateor Memoria, Beneath the Remnant Veil, The Ephemeral Knot, and To Stand Against in Witness. "Unabashedly beautiful, the objects in this exhibit showcase the work of artists who have refined their craft to a degree that can only be described as exquisite." Other participating artists : Wilde, Schulte, Schoonover, Czechowski, Calderwood, S. Byers, Apgar, Abel. I will be attending the opening reception on Friday, July 28th, 5-9 pm, and hope to see you there. Figure Twenty One.- The Anatomy Lesson. 2001-2017. 11”h x 33.25”w x 2.75”d. Lithography, Acrylic, Mahogany, Bronze, Fabric, Glass. Drafted in 2001, this sequence of paper dolls were drawn on a lithography stone at the University of Wisconsin and printed with the help of Lithography Professor and printmaking master, Jack Damer. Some may recognize the dolls from my design of Oneiroid Psychosis' 2001 release, DREAMS (with pollutions when virile). Figure Twenty One.- The Anatomy Lesson, detail. Name and date bronze plate detail. My latest sculpture, "The Ephemeral Knot", will be showing at the 13th Annual Regional Juried Exhibition at the Freeport Art Museum from November 11, 2016 to February 18, 2017. Thank you to Chicago's Sergio Gomez for accepting my work. Opening reception is Friday, November 11th, 5-8 PM. The 13th annual Regional Juried Exhibition at the Freeport Art Museum features work by artists living in the tri-state region of Illinois, Iowa and Wisconsin. Created to encourage contemporary art, this show provides an opportunity for established and emerging artists to debut their latest work. The Regional Juried Exhibition continues to build momentum each year and now attracts over 200 submissions. A wide variety of media is accepted from traditional materials such as painting and sculpture to conceptual and new techniques including video, interactive media, performance and installation art. FAM has gained the distinguished reputation of displaying a wide range of contemporary art, allowing this exhibition to become a favorite amongst visitors. The invited juror selects works for inclusion and chooses recipients for cash awards for first, second and third place. Winners will be announced at the opening reception. Sergio Gomez is a Chicago based visual artist and creative entrepreneur. He received a Master of Fine Arts degree from Northern Illinois University. Sergio’s work has been subject of solo exhibitions in the United States, Italy and Vienna. He has participated in numerous group exhibitions in Spain, Sweden, London, Mexico and the US. His work can be found in private and public collections of the National Museum of Mexican Art, Brauer Art Museum, and the MIIT Museo Internazionale Italia Arte among other public and private collections. Currently, Sergio Gomez is the owner & director of 33 Contemporary Gallery, Curator/Director of Exhibitions at the Zhou B. Art Center, contributor for Italia Arte Magazine, Art/Design faculty at South Suburban College, Creative Consultant for Idea Seat Marketing and Advertising, co-founder of 3c Wear and co-funder of the Art NXT Level Program. His weekly Artist Next Level podcast inspires and educates contemporary artists. Sergio has curated special projects for the Chicago Park District, ArtSpot Miami International Art Fair during Art Basel Week (2013, 2014), National Museum of Mexican Art, and ExpoChicago (2014) among others. 2015-2016. 7”h x 19.5”w x 10.5”d. 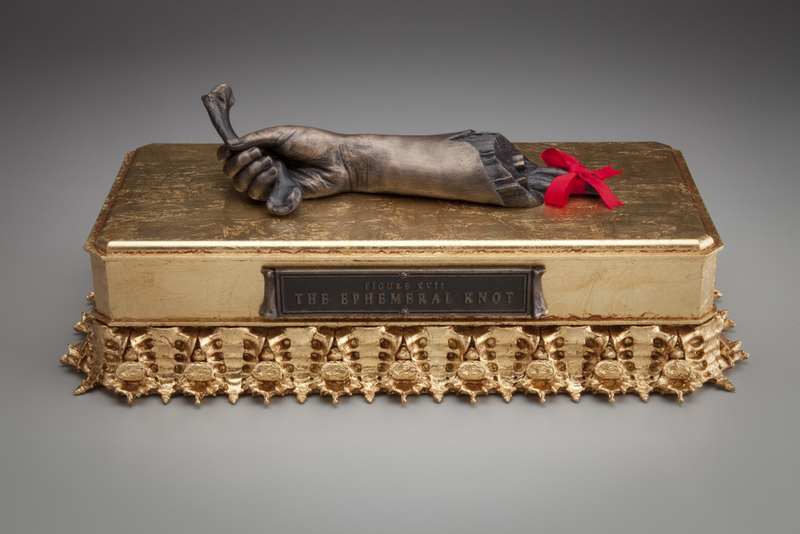 Something akin to a Memento Mori, The Ephemeral Knot is a sculpture depicting the bridge between youth and death. The child's hand grasps a clavicle bone, the first bone to begin the process of ossification. The clavicle can be regarded as ancient in terms of the body, and here represents time's passing as well as the end of life. The red silk bow is tied around three extensor muscles: Extensor Digitorum, Extensor Digiti Minimi, and Extensor Carpi Ulnaris. These muscles, in general, function to extend the fingers and wrist. Their role here is to illustrate release, a letting go of life. The knot, or bow within this piece, represents life. The loosening of a knot could be seen as the unraveling of existence. Interestingly, the silk bow will be the first component of this piece to decay, as the rest of the materials are far more time stable. Lastly, the snail, with its coiled shell, is another reference to journey and purity. The Ephemeral Knot, front detail. The Ephemeral Knot, back view. The Ephemeral Knot, back view detail. I wanted to give a special word of thanks to Nova Hansen, who was so willing to participate in the original life casting. Thank you as well to her parents, Leif and Rebekah Hansen. All photographs are by William Lemke.